AMSOIL INC. OFFERS A FAST/QUICK WAY TO GET REAL DURABILITY FROM YOUR VEHICLE ENGINE & DRIVETRAIN. Do you every wonder how much life you have left in your engine and driveline? Your ride doesn’t have to be a lost cause at 150,000 miles. We’re going to show you how to get 250,000-300,000 miles by doing nothing more than using the right lubricants and changing them out on a regular basis. One thing street rods do a lot is sit. Sitting for extended periods of time takes a toll on moving parts, seals, and gaskets. You want a lubricant that will stay in place during those times when your street rod or classic muscle car is going to sit. You also want staying power for the next time you start it up. We’re going to focus on the two most important aspects of engine oil. It keeps moving parts from touching each other and it carries heat and corrosive contaminants away from moving parts. Engine oil has the most intimate contact with an engine’s moving parts, including the hottest parts like exhaust valvestems and piston rings. It has to have qualities that allow it to stand up to the toughest conditions imaginable. When lubricating oil breaks down under high heat conditions it stops protecting moving parts, which is what leads to engine failure. Not only does engine oil keep moving parts from touching, it also coats these parts, preventing destructive corrosion. Additives in the oil help fight corrosion and resulting deterioration of the oil. Detergents and dispersants contribute even further to prevent sludge and carbon buildup. Engines are lubricated via pressure, splash, and fog. Oil contacts moving parts under pressure at the crankshaft and camshaft journals and bearings. It is also supplied under pressure at the lifters and rocker arm shafts. The layer of oil between moving parts is known as an oil film. The oil film under pressure acts as a liquid bearing on which moving parts ride without touching each other. Moving parts contact each other whenever the oil film is compromised. The oil film is compromised when the engine is shut down and it has time to sit. Oil drains off moving parts, which will have the opportunity to contact. When you hit the starter, moving parts have direct contact briefly until oil under pressure reaches critical parts. Splash and fog lubrication takes time to get slung around before it coats cylinder walls, pistons, and pins. And forget lubrication at piston rings. Piston rings have direction contact with cylinder walls, which have some lubrication, but not enough. Because both cylinder wall and rings are typically made of iron, wear tends to be uniform in both. And as rings and walls wear, they shed microscopic amounts of metal into the oil. Clean oil greatly enhances engine life by protecting moving parts. We have seen proof of this again and again in more than four decades of tinkering with automobiles. Changing oil, regardless of the type of oil you use, rids your engine of contaminants that can cause harm to an engine if left unattended. When engines sit, rust develops on castings and moving parts inside. This is why you want a lubricant that stays on all parts. Always change the oil filter any time you change oil. Contaminants can have a corrosive effect on moving parts. Microscopic metal particles from normal wear and tear can take a toll on moving parts when they sit in the oil wedge and contact moving parts. Iron particles will score soft bearing surfaces. In fact, did you know aluminum bearing surfaces are made that way to absorb metal particles and other contaminants? Hard iron particles sink into the soft bearing surfaces, which protects the crank and cam journals from scoring. Dan goes on to say, “Breaking that down further, when engines or vehicles encounter temperature extremes—extreme heat or intense cold—AMSOIL INC. synthetics are going to provide much better performance in these extreme environments. From the high-temperature side of it, the synthetic base oils and advanced additives work together to provide better protection against wear, oxidation, and deposits. “From the low temperature side of it,” Dan adds, “you just don’t get the flow of lubricant when you need it. The really bad wear comes when you start your engine and lubricants don’t get there quickly enough to prevent contact. Synthetic lubricants flow better at low temperatures and they tend to stay, which means you have lubrication on moving parts upon startup.” Another option to consider is AMSOIL INC. synthetic lubricants in your driveline, be it an automatic transmission or manual shift. Ditto for your differential, which can live happily on AMSOIL INC. synthetics. I hope this excellent article in Hot Rod Magazine gives you more insight into properly maintaining your vehicles and realizing long life using the BEST Lubricants money can buy, AMSOIL. For more information about AMSOIL products go to http://www.amsoil.com or http://www.The1sSyntheticoil.com. Should you desire to purchase products you can call 1-800-777-7094 and tell the operator you are working with ZO 9792. The kit allows Dealers to offer everything bikers need to perform an oil change in one package, simplifying ordering. Check the Dealer Zone Aug. 8 and the August AMSOIL Magazine for full details. For more information go to http://www.amsoil.com or http://www.The1stSyntheticoil.com. Should you desire to purchase AMSOIL products you can call 1-800-777-7094 and tell the operator you are working with ZO 9792. You can also purchase AMSOIL Motorcycle oil and other AMSOIL Products from Durbin Auto Store in Prattville, Al. PH: 334-365-5210. 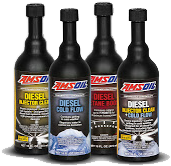 The AMSOIL diesel fuel additive line boasts several improvements, with AMSOIL Diesel Injector Clean (ADF) and AMSOIL Diesel Injector Clean + Cold Flow (DFC) featuring new formulations designed to clean both the tough-to-remove deposits surfacing in modern high-pressure common-rail (HPCR) diesel engines and traditional injector deposits. The formulations of AMSOIL Diesel Cetane Boost (ACB) and AMSOIL Diesel Cold Flow (ACF) remain unchanged. All four products feature bold new packaging. The importance of good maintenance with Diesel Engines, whether in street trucks or cars, over-the-road trucks or heavy equipment can’t be over emphasized. Good maintenance means better performance and better mileage. Increasing mileage in over-the-road trucks by just 1% can equate to a huge money bonus for an Owner/Operator. All over-the-road trucks must stop at State Weigh Stations for inspection. Particularly in California, fine are levied by the amount of Soot and Smoke emitting from Stacks on a Truck. That alone could produce a heavy fine. Save yourself money with good maintenance. For further information about these Additives and other AMSOIL Diesel Products and ALL AMSOIL products go to www.amsoil.com or www.The1stSyntheticoil.com. Should you desire to order products you can call 1-800-777-7094 and give the operator ZO 9792. The Ea By-Pass Oil Filter (EaBP) provides the best possible filtration protection against wear and oil degradation. Working in conjunction with the engine’s full-flow oil filter, the AMSOIL Ea By-Pass Filter operates by filtering oil on a “partial-flow” basis. It draws approximately 10 percent of the oil pump’s capacity at any one time and traps the extremely small, wear-causing contaminants that full-flow filters can’t remove. The AMSOIL Ea Bypass Filter typically filters all the oil in the system several times an hour, so the engine continuously receives analytically clean oil. 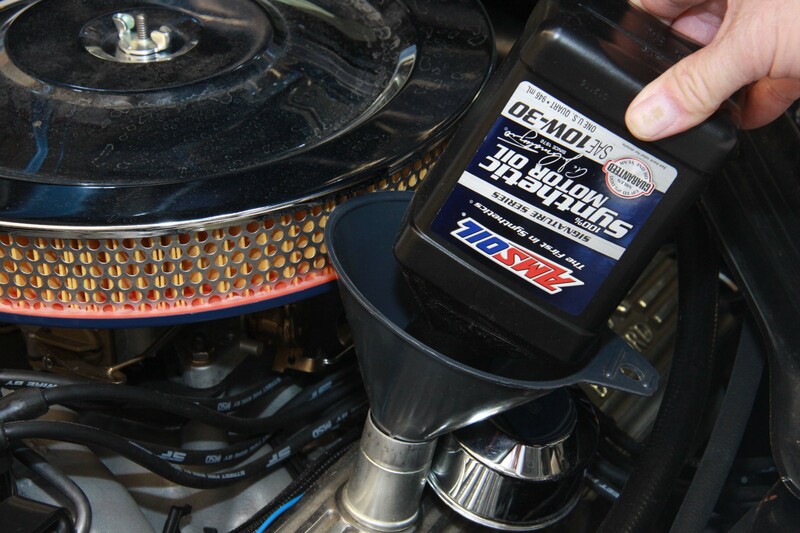 Using the AMSOIL By-Pass System is like having an oil change every 10 minutes. AMSOIL Filters have a 98.7% Absolute Efficiency at 15 microns. AMSOIL, the leader in Synthetic Lubrication, is always looking at ways to give the customer and dealer network the BEST prices available depending on their suppliers. With the extended drain intervals of AMSOIL’s 25,000 or one year service life and their oil filters of 25,000 miles or one year service life OR 15,000 miles or one year service life the cost effectiveness of the #1 Synthetic Lubrication manufacturer in America does safe people time and money. While the price of crude oil has dropped recently, the costs of lubricant base stocks, additives and other raw materials continue to rise. Most lubricant manufacturers are set to implement their fourth or fifth price increase since early February, with these increases expected to slowly work their way into the retail marketplace over the next several months. While AMSOIL has also been affected with increasing costs of raw materials, the company is holding the line on implementing another price increase. AMSOIL has limited its price increases to just three since February, while also limiting the percentage increases to approximately half of the percentage increases implemented by competing manufacturers. AMSOIL synthetic lubricants are the best and most cost-effective choice on the market, saving customers money through extended drain intervals, reduced wear and maintenance and increased fuel efficiency. Customers save even more by registering as Preferred Customers, while the OE Synthetic Motor Oil line provides customers with the enhanced protection and performance properties of a synthetic at a competitive, lower initial price. For further information go to www.The1stSyntheticoil.com or www.amsoil.com and look at the particular products of interest. Should you desire to purchase AMSOIL products you can call 1-800-777-7094 and give the operator Reference # 9792. For more information you can go to www.The1stSyntheticoil.com or http://www.lubedealer.com/SoutheasternLubricants. Should you desire to order AMSOIL Motorcycle Products or any of the other AMSOIL products call 1-800-777-7094 and give the operator ZO 9792 as your referral number. AMSOIL INC., the First in Synthetics, has launched a new website, www.amsoilracing.com, dedicated to its commitment to various forms of motorsports and event marketing. Daily columns featuring insight into AMSOIL sponsored race teams, live streaming video and unique content will give race fans a central place to stay informed on their favorite teams, series and events. For more information on Team AMSOIL racing, go to www.amsoilracing.com. For more information about AMSOIL products that support AMSOIL’s racing programs go to www.The1stSyntheticoil.com or www.lubedealer.com/southeasternlubricants. Should you desire to order products you can call 1-800-777-7094 and use ZO 9792. Today many people are concerned about the price of oil and gasoline. One way you can SAVE on these items is to EXTEND oil change intervals by installing and using AMSOIL’s By-Pass Filtration System. By-Pass systems have long been used by over-the-road truckers to provide better performance and dollar savings. I started using an AMSOIL By-Pass system when I drove a 1978 Chevrolet G-20 Vanup and down the road with NASCAR. With AMSOIL’s service life of 25,000 miles or one year, I extended the service life of the AMSOIL full-flow oil filter to 50,000 miles and the By-Pass Filter to 25,000 miles. Today that is even better. When used in conjunction with AMSOIL Motor Oil and an AMSOIL Ea or Donaldson Endurance Full Flow Oil Filter, Ea By-Pass Filters should be changed every other full-flow filter change up to 60,000 miles. AMSOIL Ea By-Pass Filters have an efficiency of 98.7 percent at two microns. (To give you an idea of how fine this is, the human hair is 80 microns in size) At normal operating RPM Ea By-Pass Filters will filter all of the oil in a typical five-quart sump in less than 10 minutes. Frequently various people submit to AMSOIL how they have installed a By-Pass System on their vehicles. Two such examples can be found here; one on a 2005 Ford 250 Superduty Pickup and also on a 2005 Chevrolet Silverado Truck. For more information on AMSOIL and other products you can go to www.The1stSyntheticoil.com, www.lubedealer.com/southeasternlubricants or http://www.allprocars.wordpress.com . Should you desire to purchase you can call AMSOIL at: 1-800-777-7094 and tell them ZO 9792 informed you about these AMSOIL products. The following information was taken from test results performed between AMSOIL and Mobil 1. These results have been continuously updated and for the latest comparisons check out the test results at the following addy: https://www.amsoil.com/lit/g1971.pdf. What is intersting is that these other companies talk about their products being excellent, great, superior etc but where are the TEST RESULTS. The AMSOIL company DOES NOT hide any results. Go into any parts store, Wal-Mart, K-Mart or other places that sell automotive producst and ask to see a Product Data Sheet on a particular oil, gear oil. transmission fluid, grease etc. You will not get such a thing and further more the person behind the counter will not have any idea what you are talking about. Ask about Flash Point, ask about Fire Point, ask About Pour Point and see the idiot stare you will get back from the person you are talking with. AMSOIL produces that information and they put it IN PRINT. Further other companies try to sell you their product and tell you it is a 7,500 or 15,000 mile service life oil. DO THEY TELL YOU THE OIL FILTERS THEY SELL WILL NOT SUPPORT THE MILEAGE CLAIM they are selling the oil for. NO they do not tell you because they are interested in selling you the oil and the rest is left up to you the uninformed customer. NO Paper or pleated paper filter will perform for those extended mileage intervals. Another point to remember is IF you are changing oil every 3,000 or 5,000 or 7,500 miles, everytime you change oil, that means another Oil Filter is sold and the old one goes into our land fills. The two most imporant tests performed on oils are called the NOACK Volitility Test and the Four-Ball Wear Test. Check out the test results and see where the oil you are using stands compared to AMSOIL. Here’s a special excerpt from A.J. Amaturio, Presiden t of AMSOIL, as written in the monthly AMSOIL Action News regarding AMSOIL and Mobil 1: Test results below. “As most of you are aware. Mobil 1 was introduced after AMSOIL had paved the way for synthetic motor oils back in the ’70’s. When it was introduced it cased great concern among many of our Dealers. But in my Presidents Message at the time, I assured everyone that having Mobil 1 on the market would only help us sell more oil. Mobil confirmed everything we had been saying about synthetic oils, and our products and claims instantly became more credible. Since then, we have always been compared to Mobil 1. When people think of synthetic motor oil, they think of Amsoil and Mobil 1, not the other Johnny-come-lately’s that have come on the market more recently. I have always said that Mobil 1 is a good motor oil, because compared to the run-of-the-mill motor oils on the market, it is. I have also always said that AMSOIL motor oil is better, again, because it is. Mobil makes their oils to run at normal drain intervals while we make ours for extended drain intervals, and therein lies the difference.& nbsp; Their oils don’t have to be as good as ours, so they are not. AMSOIL INC. set out to examine the specifics of the overly broad Nothing Outperforms…Mobil claim. AMSOIL 5W-30 Synthetic Motor Oil (ASL) and Mobil 1 SuperSyn 5W-30 Motor Oil were analyzed in five key bench tests measuring motor oil performance: NOACK volatility, flash/fire point, pour point, four ball wear and total base number (TBN). As shown in the charts below, AMSOIL outperformed Mobil 1 in all five areas. The NOACK Volatility Test determines the evaporation loss of lubricants in high-temperature service. The more motor oils vaporize, the thicker and heavier they become, contributing to poor circulation, reduced fuel economy, increased oil consumption and excessive wear and emissions. A maximum of 15 percent evaporation loss is allowable to meet the API SL and ILSAC GF-3 specifications. As shown in the graph, AMSOIL 5W-30 Synthetic Motor Oil lost an extremely low 4.9 percent of its original weight during high-temperature service, m aintaining its superior protective and performance qualities,while Mobil 1 SuperSyn 5W-30 Motor Oil lost 9.17 percent of its original weight. The Four Ball Wear Test determines the wear protection properties of a lubricant by measuring the wear scars produced by four metal balls in sliding contact under the test parameters. The smaller the average wear scar, the better the wear protection provided by the lubricant. As shown in the graph, AMSOIL 5W-30 Synthetic Motor Oil completed the Four Ball Wear Test producing a smaller wear scar than the Mobil 1 SuperSyn 5W-30 Motor Oil. The Flash/Fire Point Test determines the lowest temperatures at which application of a flame will cause lubricant vapors to ignite (flash point) and sustain burning for five seconds (fire point). Lubricants with higher flash and fire points exhibit more stable volatility characteristics and are safer to use and transport. As shown in the graph, AMSOIL 5W-30 Synthetic Motor Oil has higher flash and fire points than does Mobil 1 SuperSyn 5W-30 Motor Oil. The Pour Point Test determines the lowest temperature at which a lubricant flows.The lower a lubricants pour point,the better protection it provides in low-temperature service. As shown in the graph, AMSOIL 5W-30 Synthetic Motor Oil has a lower pour point than Mobil 1 SuperSyn 5W-30 Motor Oil. Total Base Number (TBN) is the measurement of a lubricants reserve alkalinity. The higher a motor oils TBN, the more effective it is in handling contaminants and reducing the corrosive effects of acids for an extended period of time. As shown in the graph, AMSOIL 5W-30 Synthetic Motor Oil has a higher TBN than Mobil 1 SuperSyn 5W-30 Motor Oil. Mobil will not recommend or guarantee 25,000 mile/1-year drain intervals like AMSOIL 5W-30, 10W-30 or 10W-40 or 35,000 mile/1-year drain intervals like AMSOIL 0W-30 Severe Service Synthetic does and that is a fact. No-where on the Mobil bottle does it state 25,000 miles/1-year or 35,000 miles/1-year. Mobil 1 has run the tag line for their advertising stating “nothing outperforms Mobil 1”. Mobil makes a good oil, but I’m here to tell you that it does not outperform Amsoil Synthetic Oils. They can come out with all the catchy advertising buzz words to market their oils, but in the final analysis, buzz words don’t add one thing to their product’s performance. The only reason Amsoil has continued to grow and prosper competing with large corporations like Mobil is that AMSOIL products have consistently performed better. Ok so you are still a pessimist and a doubting Thomas. Guess the proof is in the pudding. Now I realize ALL people and ALL vehicles do not perform the same but time after time the same testimonials and results keep appearing so there must be something to the fact that Synthetic Lubricants perform better than petroleum lubricants. And the BEST thing about it all is that AMSOIL, the #1 Synthetic in America OUTPERFORMS all other so called Synthetic products. But you WILL NEVER BE A BELIEVER until you use AMSOIL and see for yourself. The Next Bite host Gary Parsons experienced immediate fuel economy benefits after switching his Ford F250 to AMSOIL products. If you want to experience the same as Gary Parsons than you need to check out ALL AMSOIL products at www.The1stSyntheticoil.com or www.lubedealer.com/southeasternlubricants. And should you desire to order you can call 1-800-777-7094. When you do use ZO 9792 when ordering. Price is High BUT Cost is Low!! !